I’ll be honest with you guys: I was kind of certain I was going to fail HARD with this little “trick” I’m about to show you. I waited until I started seeing new growth, so I think I’m in the clear and can finally share. 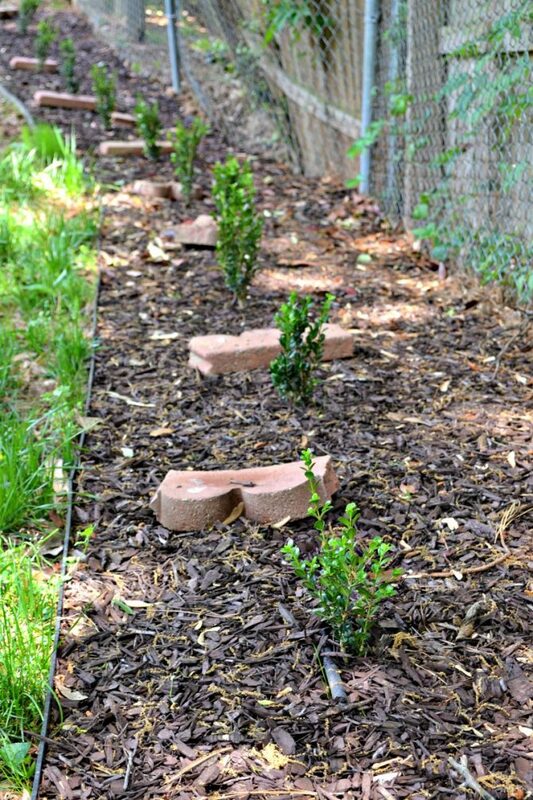 I first hinted at my cheat last month when I mentioned that I planted a bunch of new boxwood shrubs along my backyard fence line. Fourteen of them, to be exact. But the truth is, I only spent real dollars on seven of them, because I was able to successfully split each shrub in half! The trick? All I had to do was look for plants that had two existing stems in the same pot. My reason for the new hedge line was twofold. With the way my lot works out in my neighborhood, I have four different neighbors’ back yards facing my own, which has led to a hodgepodge of fencing surrounding me on three sides (some of which have the “ugly” side facing me, and some with the cosmetic side). If you look back at the yard fill-in project I did last summer, you can see and compare each. I could put up my own new fence line (and sort of have been, slowly), but finishing the rest is both time-consuming and costly, and not really convenient to do in the near future with all of the other exterior and interior projects I have going on this year. I also have my own chain link fence on two sides of the yard, which while ugly, is still very functional for Charlie The Escape Artist and other pups who come to visit. So, by planting a bunch of shrubs along the longest part of the yard, I can actively be growing a newer, more beautiful division that masks my neighbors’ fences and my own while I get to work on more urgent projects. It’s not immediate, of course, but then again hardly anything with this house ever is. When I went looking for hedge shrubs, I wanted to find the cheapest and the hardiest ones I could find. Given that spring sales are abundant right now, I was able to find pots of boxwoods at a big box store for $5 each. The common boxwood isn’t really my favorite plant in general because they are pretty boring to look at. However, when healthy, they have a decent growth rate, make for excellent hedges, and can seamlessly grow into each other with very little care (aka neglect, which is what I need to be doing right now). I noticed while shopping that many of them had two stems growing out of each pot rather than one, and it got me thinking: could I possibly just split them into two separate plants? Well, since you probably know from experience that I like to take a gamble with DIY projects, I decided to go for it so I could tell you if it’s worth doing. It is! The process is really pretty simple, but I wanted to give this new hedge the best no-fuss start I could. I started with some landscaping fabric and ran a line of flexible landscape edging to contain the mulch. 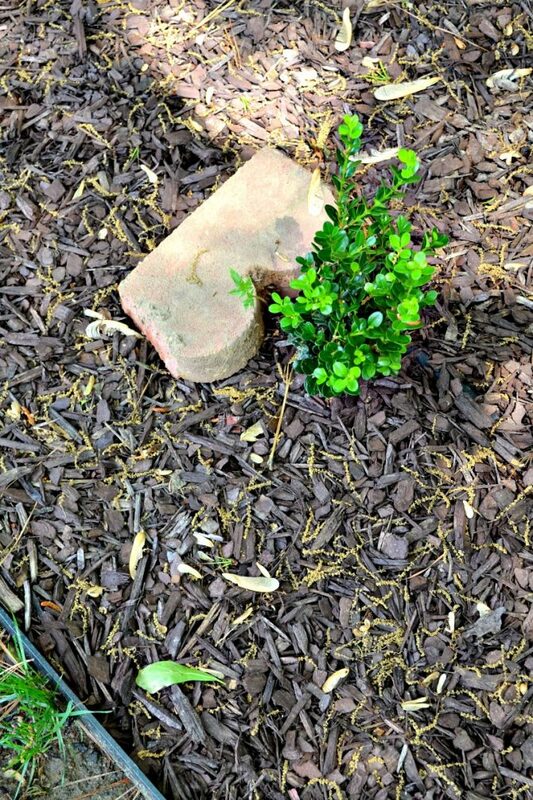 Then after spacing and digging holes, I split each boxwood plant along the middle to separate its two stems using a small garden shovel and utility knife (I didn’t want to rip/mangle them too much, so cutting seemed better than tearing with my hands). Then, I used my new favorite secret weapon: root growth hormone. 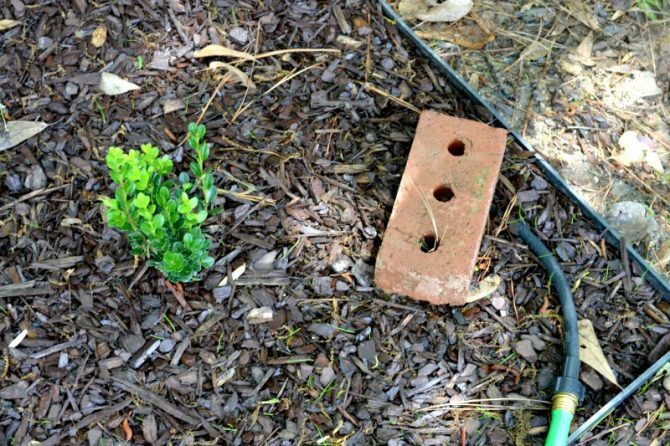 I’ll be sharing some other wins thanks to this handy stuff soon, but for the hedges, I just sprinkled them on the shredded ends of the plants once split, then plopped them into the ground. The soil in this back area has excellent drainage since it was part of the fill-in project, so I needn’t worry about soil quality. I covered over the entire hedge line with mulch and added some fertilizer along with a soaker hose (to keep the plants watered until they were established, but not double my workload in the process, this hose has a bunch of holes in it to periodically water along the length of it). The hose comes loopy and kinks up easily, so I weighted them down with extra edging and bricks I found from removing the trees in years past since the mulch wasn’t heavy enough to do that on its own. Eventually, I’ll probably replace them with some landscaping staples to keep the hose low-profile. 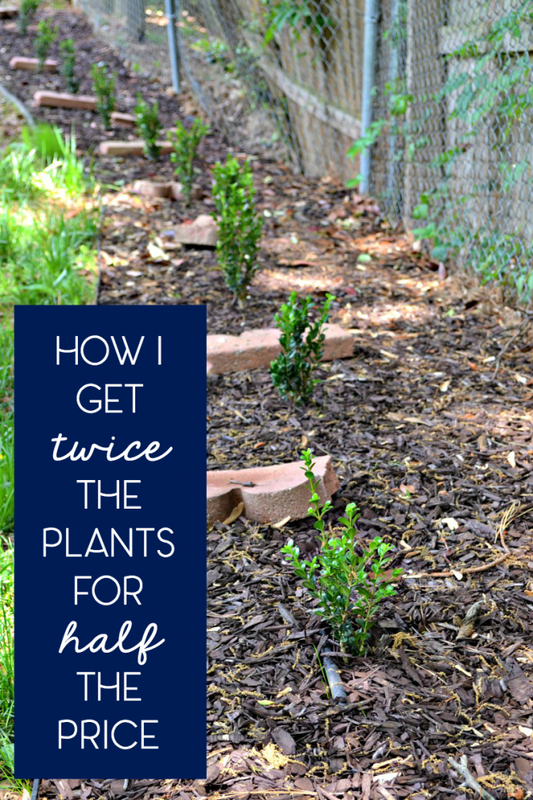 So, that’s pretty much how I got twice the hedge for half the price. Thanks to the drip line and recent rain, the boxwoods are already sprouting new growth and seem to be doing very well! They’re even tolerating Charlie’s frequent strolls around the perimeter (she seems to have a liking for how mulch feels underfoot, I suppose). It will take several years before they grow tall enough to hide anything, but in the meantime, I’ll be able to remove the chain link fence, build the new shed, and concentrate on the next 1,257 things on the to-do list. Oh, and all of that green grass you see on the left of that photo? That’s been a success too… more soon! Great job! Going to be beautifuk when grown up! Question: There was a boxwood outside of my kitchen door at one apartment. Unfortunately, it smelled like cat urine which I understand is normal for some types. I understand there are some boxwoods that do not have this scent. Do you know which ones don’t smell? So googling it turns up that English boxwoods are sometimes the ones that smell like that, but I really don’t know of or have ever smelled it! Then again, I live in Georgia, so I’m betting that the ones I bought were of the Littleleaf variety, which is supposed to be really good for the growing zone I live in (not that I looked… having never heard of it, I didn’t make a note, but these are also growing away from my house, so I doubt even if they smelled that I would notice it all that much). So, I would suggest noting the latin names of the English boxwood and keep them in notes on your phone, and make sure you don’t buy them if you get new ones! Thanks, Sarah, for taking the time! I’ve been so jammed for time the past few weeks, Google must think I’ve terminated our relationship! do! It looks like Sarah has the rounded leaf type. Where can I find those boxwood plants? I am living in the central city. I want that plant but there are no such kind of plant in my area. You can usually find them at any big box store that has a nursery or a commercial nursery. But usually if something isn’t sold in your area, it’s because it’s not known to grow very well there. 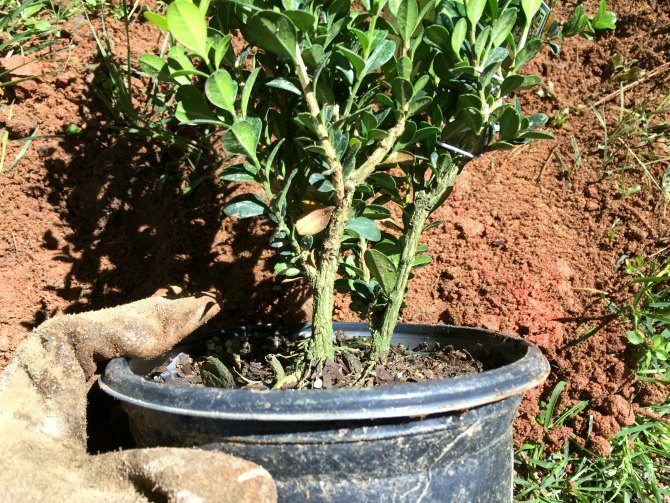 You might want to try a different type of hedge plant, such as holly or tea olive. Good point! I do have a number of those. Thanks for the tip! Hey Sarah, it’s nice to be here on your blog. I am a first time but I am alraady loving your blog; the design and your ability to get really creative in coming up with stuffs that are not usually always there. You will make a good wife…will you marry me, Sarah? Speaking about your innovation, I love it and did you say you got those 5bucks? …So how are the plants now, are they growing well? I hope you will share an update of that with us, will you? I will be here to read it. Wow, what an excellent idea! As a fellow first-time home owner on a tight budget, I can appreciate your relentless dedication to DIY home improvements. Have you considered any additional soil amendments to expedite the growing process? I’ve had excellent results with organic worm castings (not as gross as it sounds). You can make a “tea” for easy watering application and a little goes a long way (aka frugal!!). I still have most of the 10 lbs bag I purchased at the nursery for $10 and it has done wonders for my landscaping. Thanks for sharing!! Hi Sarah – love the idea about two stems and splitting. Might I suggest also taking cuttings and rooting them so you wind up with double the number you have now? Lots of info online and at library on how to do this. It’s just that frugal (aka CHEAP) is my middle name. Also, you might want to put up a cheap wire barrier to keep dogs away from these plants. My dogs love to lay (crush) my perrennials because it’s cool bedding in hot weather. You can use fishing line and a few stakes if you want an invisible barrier. No point in losing those plants after all that money and hard work! It’s been a couple of years now, and they luckily haven’t crushed these plants, though I have felt that worry before. They seem to prefer the cool spots in the grass instead, go figure. I’ve tried cuttings and only had a small amount of success with it, so I need more practice!